South Sudan: "I am tired of running"
The first thing Mary remembers is the sound of artillery and gunfire. The 32-year-old mother of five was doing her rounds as a cleaner at Médecins Sans Frontières/Doctors Without Borders (MSF)'s hospital in Wau Shilluk (South Sudan), when she heard the encroaching violence in the distance. The fighting was drawing closer and closer to the town. Alarmed, Mary found her two children and fled north with the rest of the population. In the chaos, she lost her 70-year-old mother who couldn't walk. They found a village 20 kilometres away - yet, at this point, Mary decided to go back to find her mother. "It was frightening to go back [to Wau Shilluk]," says Mary. "Thankfully I found her walking on the road. I was so happy to see her." The family of four journeyed some 80 kilometres on foot, without food or water. "I was so worried that the fighting would catch up with us," she remembers. "My mother and children were too exhausted to walk." During their escape, Mary's youngest son fell sick. Eventually, they reached the town of Aburoch, where MSF has opened a field hospital - responding to the urgent medical needs of the displaced population. Mary, an MSF cleaner, with her 70-year-old mother in Aburoch town. They are safe from the conflict, for now. Since late January, nearly 30,000 people have fled fighting around Wau Shilluk, in the Greater Upper Nile of South Sudan, and moved to Aburoch town and the bush areas south of Kodok. “The humanitarian needs of those that fled are vast and are not being met,” says Abdalla Hussein Abdalla, MSF deputy country manager for South Sudan. “Most of the people who fled left all their belongings behind. "I have been forced to move five times since the start of this war, and I am tired of running." We have responded to the urgent medical needs of this displaced population by opening a field hospital with inpatient, outpatient and emergency services in Aburoch, where up to 15,000 people have settled. Two mobile clinics are also operating south of Kodok where part of the displaced population has settled. Over the last two weeks, we have provided an average of 300 consultations a day: six times the number that was provided in Wau Shilluk hospital before the evacuation. Those who have settled in these areas have very little to survive on. For weeks people have only received an average of two litres of clean water per person. While in recent days this has slightly improved, the amount is still below guidelines for what is required to remain healthy in an emergency environment. Among the families we have visited, over 90 percent were lacking basic supplies such as plastic sheeting to protect them against the sun or the cold at night, jerry cans to collect clean water or cooking pots. MSF staff respond to patients at our field hospital in Aburoch, the majority of whom are displaced people from Wau Shilluk. “Our doctors see many cases of respiratory infection and of acute diarrhoea which is partly explained by the terrible living conditions," says Abdallah. "Children, pregnant women and the elderly are especially vulnerable in this situation. Francis Ronyo, an MSF nurse who worked in our hospital in Wau Shilluk, was one of the national staff members on duty when the order was given to evacuate and leave for Kodok. They were forced to make a difficult decision to leave, even though the hospital was still receiving patients in critical condition. MSF nurse Francis Ronyo had to evacuate Wau Shilluk hospital and flee with patients to Kodok. As the nurse supervisor, Francis decided to load the patients onto a tractor and trailer and went with them to Kodok - unfortunately one of them died on the way. When Francis and his patients arrived in Kodok, he continued to serve the sick and wounded in any way he could. "We were overwhelmed by the number of patients," he remembers. Though safe for now, Francis and many others from Wau Shilluk face an uncertain future. The nurse's family lives in another region of South Sudan, relocated to stay far from the fighting. He currently struggles to get in contact with them. "I cycled 45km to make a phone call to my wife and children," he says. "The telephone network was shut down in January 2017, and I'm worried about their security." To make matters worse, poor living conditions are having a major impact on the displaced population. "Currently, the situation here is incomparable to that of Wau Shilluk where we lived just a few weeks ago," he says. "Here, there is hardly any water, shelter or food. For most people arriving from Wau Shilluk, this is not the first time that they have been displaced. Mary and her family have moved multiple times since the conflict began. "I don't know where we will go next," she says. "I have been forced to move five times since the start of this war, and I am tired of running." MSF is worried by the insufficiency of humanitarian assistance available and reiterates its call for all those involved in the fighting to guarantee the safety of civilians. “Many people don’t know where to settle because they are afraid the fighting will force them to flee again," says Abdalla. "It is essential that they are spared from any more violence, and that assistance is provided to them where they choose to settle." An MSF member of staff attends to a young child with malaria, at a displaced persons site in Kodok. We managed to visit Wau Shilluk at the end of February and again in early March, where our team assisted 47 people who had stayed in and around the town, mainly elderly and disabled people who were unable to leave. 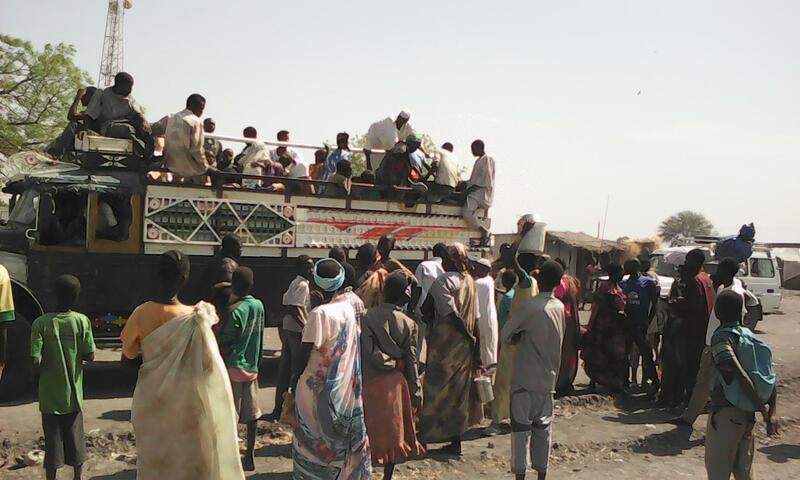 Thirty-eight of them have since been taken to the Malakal Protection of Civilians site upon their request. The remaining civilians in the town are in clear need of assistance and protection. Humanitarian workers should be allowed to provide them with the help they require. During this recent visit, we were able to return to our hospital in Wau Shilluk and survey the condition of the facility. “Wau Shilluk was looted of all medicines including life-saving drugs and essential supplies" explains Abdalla. "We have called on those fighting to respect the protected status of medical facilities. "Unfortunately, our hospital is in a terrible condition. Medication for the treatment of tuberculosis, HIV/AIDS and kala azar are now all gone.